With more and more mobile devices coming into the market each day, user dependence on them is ever-increasing. We can no more do without our various gadgets — they have become part and parcel of our lives. While enterprise has begun adopting the BYOD trend in a big way, one other field that is also coming under its influence is that of education. Many schools in the United States of America are now being open to students using their personal mobile devices within the classroom environment. Several established colleges are making the use of tablets customary, even developing apps exclusively meant for the use of that particular institution’s students, teachers, and other staffers. Adopting BYOD in education does benefit the institution concerned. Firstly, it enables students to use the device they are most familiar with; that puts them at ease and increases their productivity. This helps the educational establishment reduce the cost of circulating books, laptops, or tablets to students. A well-planned mobility program could give students instant paperless access to lectures, notes, presentations, and other material, which would help them work from home as well. They could even submit their papers electronically — this would be especially useful at times when they cannot attend school; for example, if the student needs to be out of town for a while, during periods of illness, and so on. Cost Control: Students’ usage of their own mobile devices reduces all-round costs for the school. The management no longer needs to invest in distributing books, paper, and other material to its students. Students take care of and maintain their own gadgets — that takes the responsibility of the concerned institution. Concentrated Funding: Schools can use the extra funds, thus saved, to finance students in need. They can also offer better and more recent technology with the funds in hand. Full Control: Students have complete control of all the software and other material they wish to download, without limitations. Unlimited Information: Internet access on students’ tablets enables them to browse the web, perform research, collect material, and glean all the information available on the subject of their choice, while on the move. Increased Productivity: Training students to use mobile devices responsibly, within the classroom environment, teaches them to use the latest technology in the most effective and productive method. Latest Technology: The younger generation usually tends to be up-to-date with the latest technology. Permitting them to bring their smartphones and tablets to school takes the responsibility of the institution to provide cutting-edge technology at all times. Funding Concerns: Schools, especially the smaller ones, will have to think of funding for eBooks and wireless service, especially for underprivileged students. They will also have to make provisions in case of damaged, misplaced, or lost devices. Some households share devices among them. In such a case, schools have to chalk out policies for device use, assign data access to only authorized users, decide on payment in case of damage, and so on. Training Teachers: Educational establishments will have to invest in training teachers to effectively use the latest mobile technology within the classroom. 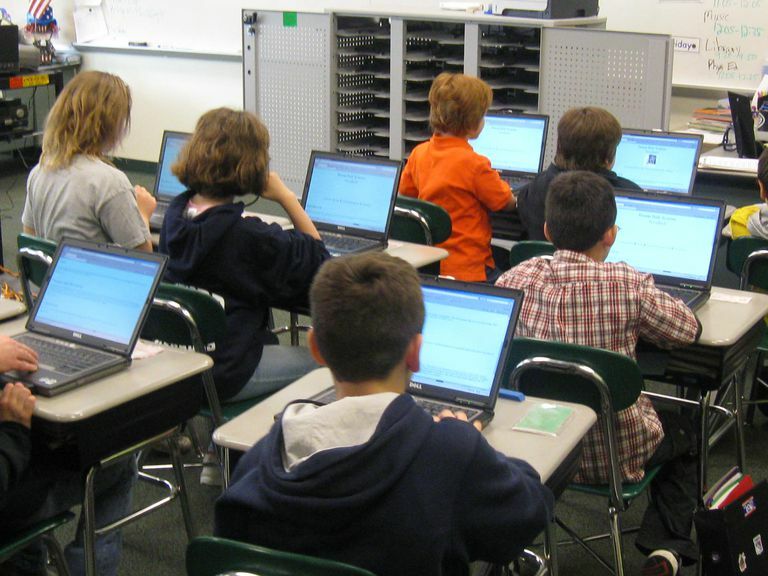 Privacy Issues: Privacy is one of the biggest issues surrounding BYOD in education. Schools will have to constantly supervise the material that is being accessed and shared, especially among younger students. Control Struggles: Instances of online cheating can potentially increase with students getting unlimited access to chat and sharing software. The IT staff will have to keep an eye on the data being transmitted and copied, at all times. Mobile Access: Educational institutions will have to draw out a clear plan on the types of mobile devices that can be permitted inside the school — the number of Wi-Fi access points around the establishment, and bandwidth, central data storage, mobile malware detection service, data protection, law enforcement policies, and so on and so forth. Societal Divide: Students’ use of smartphones and tablets as a style statement would further create a divide between the haves and have-nots in school. Disruption: Students may end up using their devices for chatting and logging onto social networks, thereby neglecting their academic duties. BYOD? What Does That Even Mean? Should You Give a PC as a Graduation Gift?